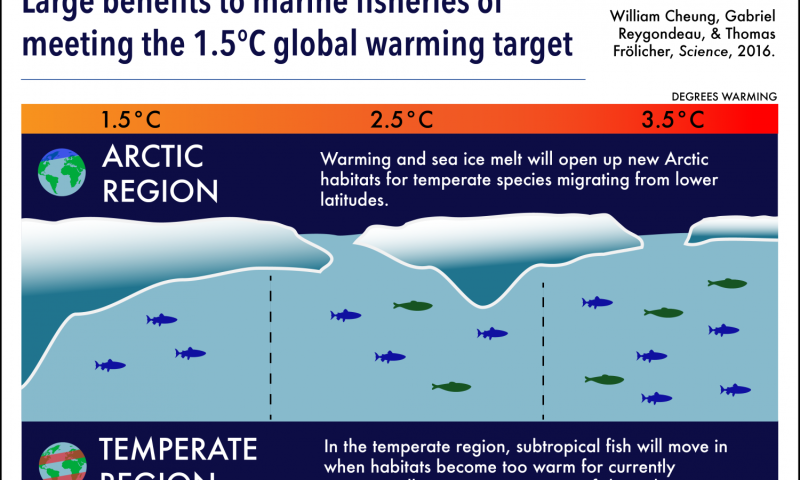 If countries abide by the Paris Agreement global warming target of 1.5 degrees Celsius, potential fish catches could increase by six million metric tons per year, according to a new study published in Science. The researchers also found that some oceans are more sensitive to changes in temperature and will have substantially larger gains from achieving the Paris Agreement. "The benefits for vulnerable tropical areas is a strong reason why 1.5 C is an important target to meet," said lead author William Cheung, director of science at the Nippon Foundation-Nereus Program and associate professor at UBC's Institute for the Oceans and Fisheries. "Countries in these sensitive regions are highly dependent on fisheries for food and livelihood, but all countries will be impacted as the seafood supply chain is now highly globalized. Everyone would benefit from meeting the Paris Agreement." The authors compared the Paris Agreement 1.5 C warming scenario to the currently pledged 3.5 C by using computer models to simulate changes in global fisheries and quantify losses or gains. They found that for every degree Celsius decrease in global warming, potential fish catches could increase by more than three metric million tons per year. Previous UBC research shows that today's global fish catch is roughly 109 million metric tons. "Changes in ocean conditions that affect fish stocks, such as temperature and oxygen concentration, are strongly related to atmospheric warming and carbon emissions," said author Thomas Frölicher, principal investigator at the Nippon Foundation-Nereus Program and senior scientist at ETH Zürich. "For every metric ton of carbon dioxide emitted into the atmosphere, the maximum catch potential decreases by a significant amount." Climate change is expected to force fish to migrate towards cooler waters. The amount and species of fish caught in different parts of the world will impact local fishers and make fisheries management more difficult. 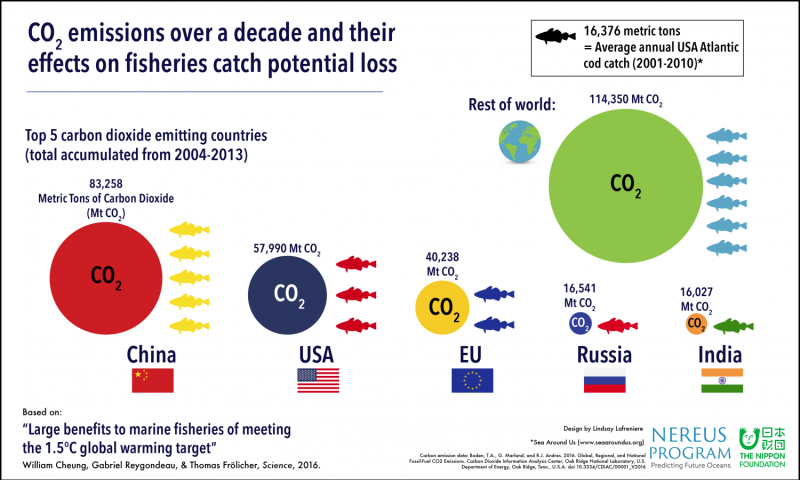 Comparing the top five carbon dioxide emitting countries to the fisheries catch potential loss. Credit: Design by Lindsay Lafreniere, Nippon Foundation-Nereus Program. The findings suggest that the Indo-Pacific area would see a 40 per cent increase in fisheries catches at 1.5 C warming versus 3.5 C. Meanwhile the Arctic region would have a greater influx of fish under the 3.5 C scenario but would also lose more sea ice and face pressure to expand fisheries. The authors hope these results will provide further incentives for countries and the private sector to substantially increase their commitments and actions to reduce greenhouse gas emissions. "If one of the largest carbon dioxide emitting countries gets out of the Paris Agreement, the efforts of the others will be clearly reduced," says author Gabriel Reygondeau, Nippon Foundation-Nereus Program senior fellow at UBC. "It's not a question of how much we can benefit from the Paris Agreement, but how much we don't want to lose." "Unless NASA says their planet flattening crisis is as real as they say the planet isn't flat, all climate change spending is to be terminated permanently." **Will NASA ever say it and end this debate to "save the planet" before it's too late to say it and save our children's lives? There are so many variables and uncertainties in this study that the conclusions are as accurate as examining sheep entrails. The scientists behind these studies are simply modern haruspices divining their own apocalyptic vision of the future to prey on the weak-minded who shower them with denarii to save them from the prophesied doom. It's a great gig if you can get it; haruspices were popular with the Romans, Etruscans and Babylonians. It's all wine, women and song until the new emperor comes along and dismantles the state cult, so enjoy it while you can. In a world where people are acquainted with the proper care and use of their brains, a study based on the CMIP climate models would be chucked into the trash without a second thought. These studies are based not on observations of the natural world, but on arbitrarily manipulated computer simulations that come nowhere close to accurately representing the complex, non-linear chaotic system that is Earth's climate. How do fools like this, manage to acquire a degree? And from my local university too! The hard science proves beyond any shadow of a doubt, that there is no such thing as a GHG, which means that neither we, solar radiation nor CO2, have any affect on climate, whatsoever. However, CO2 is the food of Phytoplankton which are the foundation of the ocean's food chain. Any limits or reduction of atmospheric CO2, does an injury to the whole aquatic ecosystem, of which the fish are an integral part. The Paris agreement is a farce, just as AGW is and CO2 is a blessing and a gift to all life, on land and at sea. These fools are trying to take the food right out of our mouths! "the biggest scientific deception in history." The fossil record proves that life is more plentiful and more diversified in a warmer climate. I dunno. Why eat fish? They are little filters swimming around in polluted waters and concentrating all that dirt in their flesh. Instead of increasing the food supply, reduce the number of desperate consumers by destroying the religion-based cultures which have survived by outgrowing and overwhelming their neighbors by design. The world will begin to cool off as well. that everything will be ok by ignoring the pollution and GHG's we're pouring into the atmosphere? the fossil record also demonstrated that the dinosaurs and most other species (that lived in warmer climates & have become extinct) lived longer and more successfully than humans have... so would you like to eradicate the humans for the future resurgence of dinosaurs? Do you understand what you just wrote ? Just because mommy said you can go back to your room and hit the keyboard with dumb thumbs doesn't mean you have something meaningful to say, you still need to go ask your daddy what the scientific evidence means. You want to add fish to the sea? Tell the Asians to stop over-fishing and stop breeding. In 20 ye ears there will be 15 billion of them alone. Guess how the fish will fare then? If oil continues to expand their filthy empire by destroying the ocean there will be no fish to have an argument to begin with.